CD105 in vitro SimpleStep ELISA® (Enzyme-Linked Immunosorbent Assay) kit is designed for the quantitative measurement of CD105 protein in human serum, plasma, cell culture supernatant, and cell and tissue extract samples. CD105 is a major glycoprotein of vascular endothelium. CD105 is involved in the regulation of angiogenesis. It may play a critical role in the binding of endothelial cells to integrins and/or other RGD receptors. CD105 acts as TGF-beta co-receptor and is involved in the TGF-beta/BMP signaling cascade. It is required for GDF2/BMP9 signaling through SMAD1 in endothelial cells and it modulates TGF-beta1 signaling through SMAD3. CD105 is a homodimer that forms a heteromeric complex with the signaling receptors for transforming growth factor-beta: TGFBR1 and/or TGFBR2. It is able to bind TGF-beta 1, and 3 efficiently and TGF-beta 2 less efficiently. Circulating soluble form of CD105 is elevated in patients with preeclampsia, atherosclerosis and certain cancers including breast, colorectal, and myeloid malignancies. Our Abpromise guarantee covers the use of ab217773 in the following tested applications. Standard curve comparison between human CD105 SimpleStep ELISA® kit and traditional ELISA kit from leading competitor. SimpleStep ELISA kit shows comparable sensitivity. Example of human CD105 standard curve in Sample Diluent NS + Enhancer. Example of human CD105 standard curve in 1X Cell Extraction Buffer PTR + Enhancer. Interpolated concentrations of native CD105 in human serum and plasma samples. The concentrations of CD105 were measured in duplicates, interpolated from the CD105 standard curves and corrected for sample dilution. Undiluted samples are as follows: serum 2.225%, plasma (citrate) 2.225%, plasma (heparin) 2.225% and plasma (EDTA) 2.225%. The interpolated dilution factor corrected values are plotted (mean +/- SD, n=2). 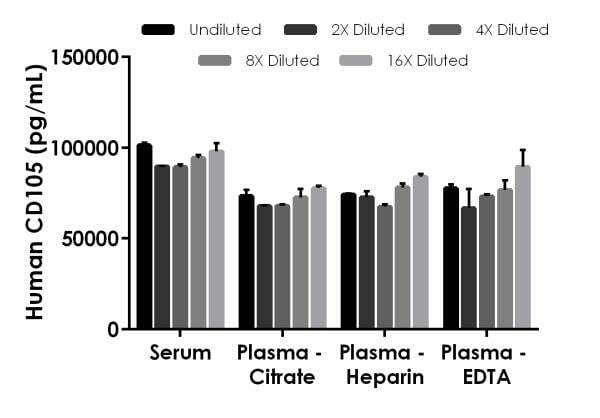 The mean CD105 concentration was determined to be 94,646 pg/mL in neat serum, 71,971 pg/mL in neat plasma (citrate), 75,408 pg/mL in neat plasma (heparin), and 76,842 pg/mL in neat plasma (EDTA). Interpolated concentrations of native CD105 in HUVEC cell extract, human placenta tissue extract and human heart tissue extract. 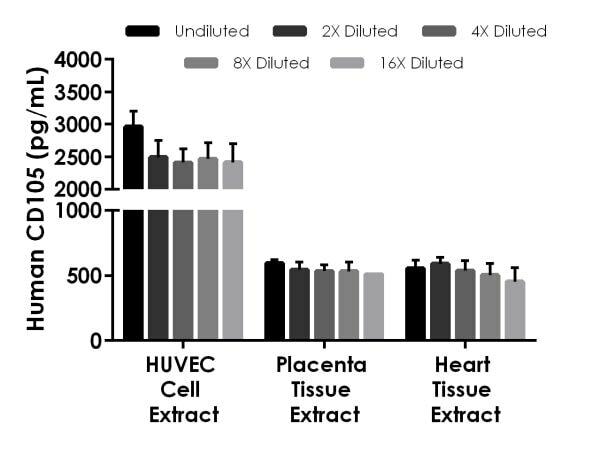 Interpolated concentrations of native CD105 in HUVEC cell extract based on a 40 µg/mL extract load, human placenta tissue extract based on a 90 µg/mL extract load, and human heart tissue extract based on a 60 µg/mL extract load. The concentrations of CD105 were measured in duplicate and interpolated from the CD105 standard curve and corrected for sample dilution. The interpolated dilution factor corrected values are plotted (mean +/- SD, n=2). The mean CD105 concentration was determined to be 2548 pg/mL in HUVEC cell extract, 542.9 pg/mL in placenta tissue extract, and 528.1 pg/mL in heart tissue extract. 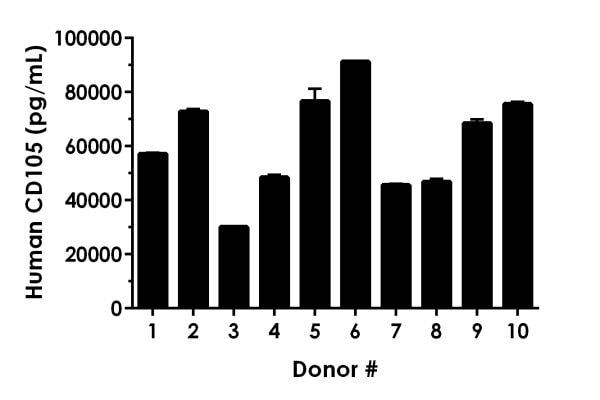 Serum from ten individual healthy female human donors was measured in duplicate. Interpolated dilution factor corrected values are plotted (mean +/- SD, n=2). The mean CD105 concentration was determined to be 61,333 pg/mL with a range of 30,103 – 91,256 pg/mL. Serum levels of CD105 are increased during the third trimester of pregnancy, especially in women with pre-eclampsia. Serum from 10 healthy (not pregnant) female individuals, 5 healthy females in the third trimester of pregnancy (pooled), and 1 individual female in the third trimester showing signs of mild pre-eclampsia were tested for levels of CD105. The concentrations of CD105 were measured from serum in samples in 3 different dilutions in duplicates and interpolated from the CD105 standard curve. The interpolated values are plotted (mean +/- SD, n=3). 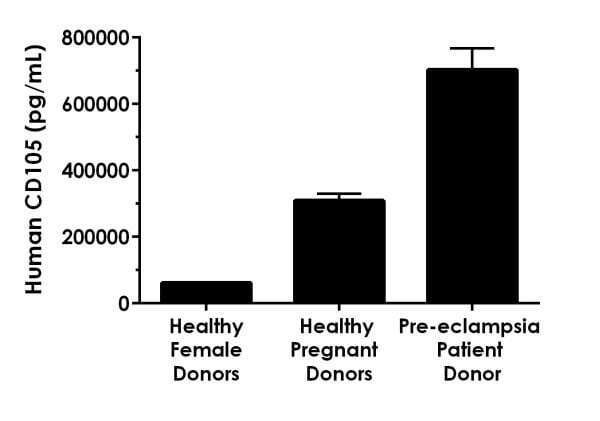 The mean CD105 concentration was determined to be 61,333 pg/mL in healthy female donor serum, 30,8945 pg/mL in healthy pregnant donor serum, and 703,119 pg/mL in pre-eclampsia patient serum. ab217773 has not yet been referenced specifically in any publications. 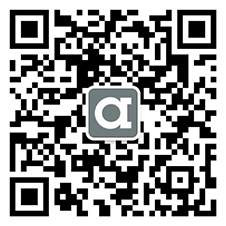 There are currently no Customer reviews or Questions for ab217773.